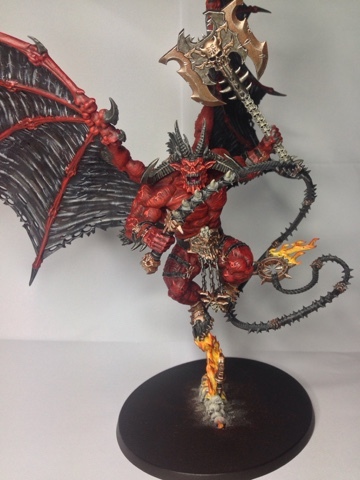 He really is a gorgeous model and so much detail! I won't lie he has taken me a while to complete (I assembled him the day after I got him and I got him on pre-order) but he's been totally worth it. By the way the pictures I have are all pre-basing but I'm so proud of how he has turned out that I can't wait for the Agrellan Earth to dry. 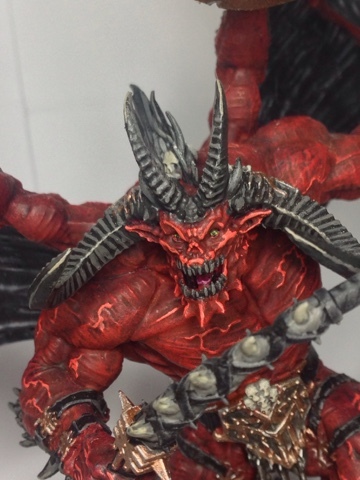 So his skin is the same as I did for my other Khorne daemons (start with Khorne Red and work our way up to Wazdakka Red with Nuln Oil over the Khorne Red and Bloodletter applied over everything else). I started with the skin as it's the largest area to cover so I figured I could do it in a messy way and speed things up with dry brushing. His veins were painted with Wild Rider Red just to make them pop from the rest of the body. As he can be fielded with a Daemonkin force as well as pure Daemons I added a couple of spots of green onto him. The first being this star at the base of his back. This not only breaks up the mass of red on his back but also serves to tie him in with my CSM army where the spot colour is green. In every unit there is green somewhere (usually a chaos star accessory and/or eyes) so Mr B. Thirster gets a green star too so that he is cohesive. He also has green eyes just like the CSM that summoned him. As expected from a Greater Daemon of Khorne there were a LOT of skulls dotted around and they were done with a base of Stormvermin Fur, then a 50:50 mix with Ushabti Bone, then pure Ushabti Bone and then a very small highlight with White Scar. The horns were done with Skavenblight Dinge, then Stormvermin Fur and then highlighted with Karak stone. Funnily enough the hair was painted the same way just without the Karak Stone. 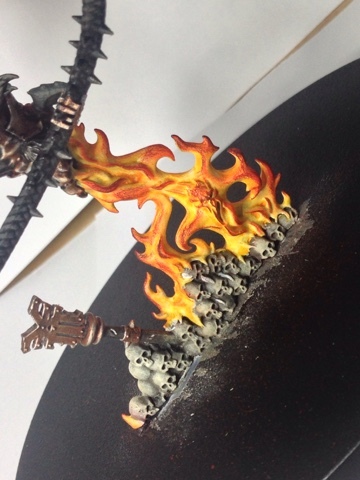 I have to say I'm most impressed with how the flames came out. I know I'm good at fire but I think this is my best yet. I did this one a little differently and it's a combination of a few different techniques. Firstly I painted very thin layers of White Scar (took about four coats to get it pure white) and then gave it a Casandora Yellow wash all over. It settled in some places more than others so there was some automatic tonal variation to work with. From there my next step was going to be to give it a wash with Fuegan Orange but that works better where there's a definitive "outside area" to work with which this flame didn't have with the bulk of it being a solid surface area to work on so I switched it to a dry brushing with Troll Slayer Orange. Lightly though as I didn't want to overpower the yellow. Then came an even lighter drybrushing with Wild Rider Red (it's more orange-y than the others so it was a great transition colour) and an even lighter brush with Khorne Red. Finally a very very very very light drybrushing with Abaddon Black et voila! I did the same on the fire on the whip too. I really can't believe how well he's turned out! 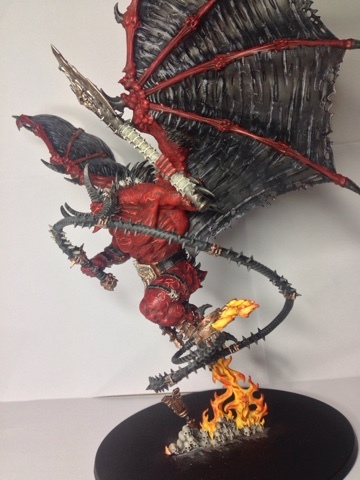 My next Bloodthirster (oh yes there will be more!!) 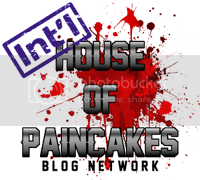 will be a Bloodthirster of Insenate Rage which which comes complete with an absolutely huge two handed axe and looks very cool. 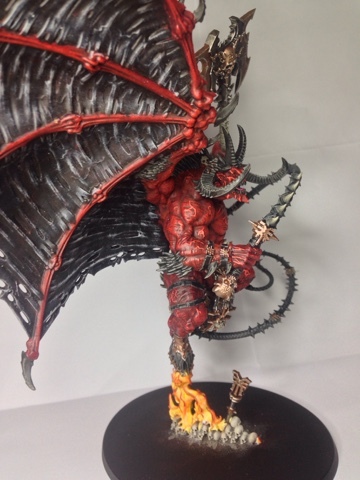 I have a few big projects to get through but once I've whittled them down a bit then it'll be time to get my next Bloodthirster. 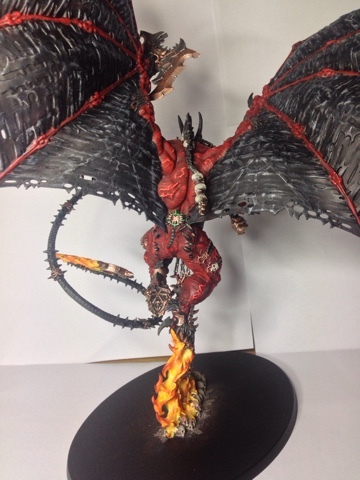 Unless of course a new Greater Daemon is released because then I have to have one of those. It's the law. Really great job Luke. The skin looks particularly awesome and I love the work on his face!